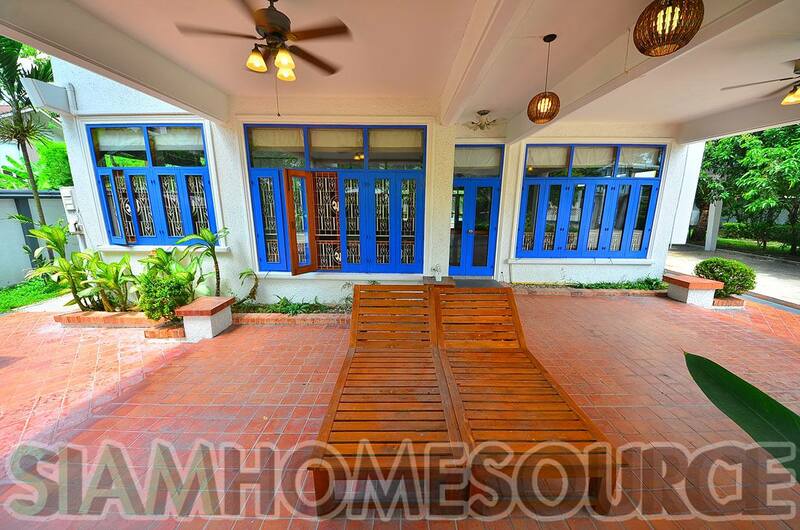 Words absolutely cannot describe the feeling you get when you walk through the gate of this Bangkok family house. 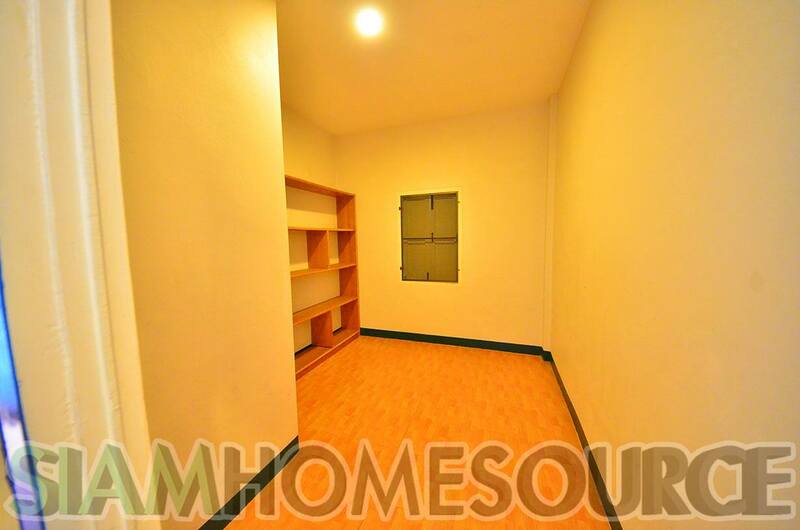 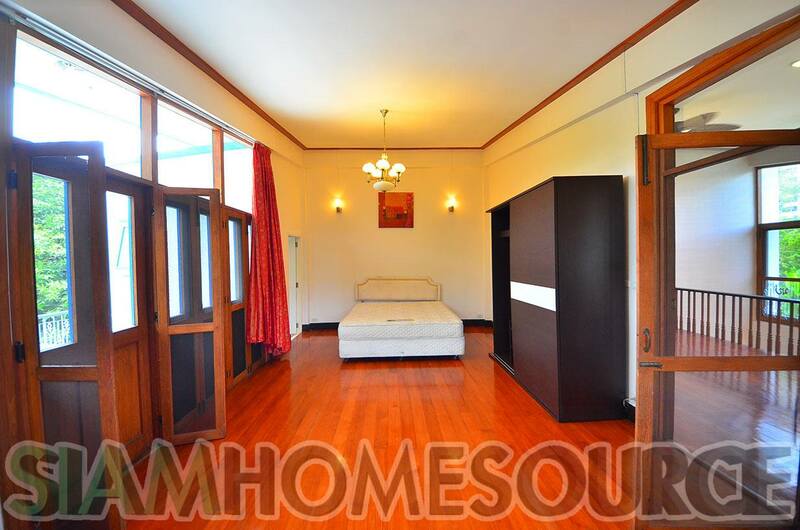 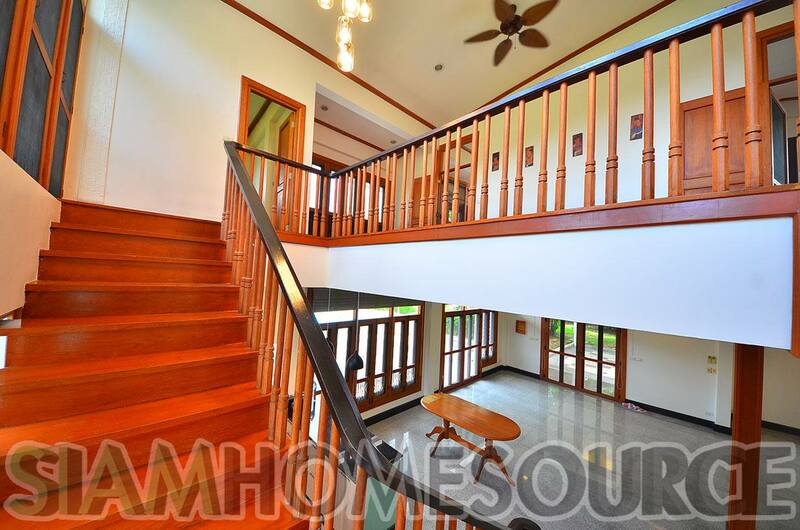 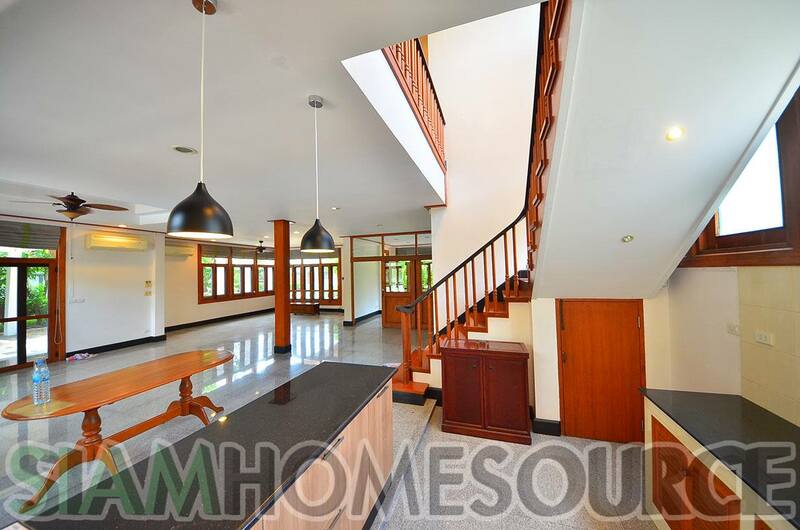 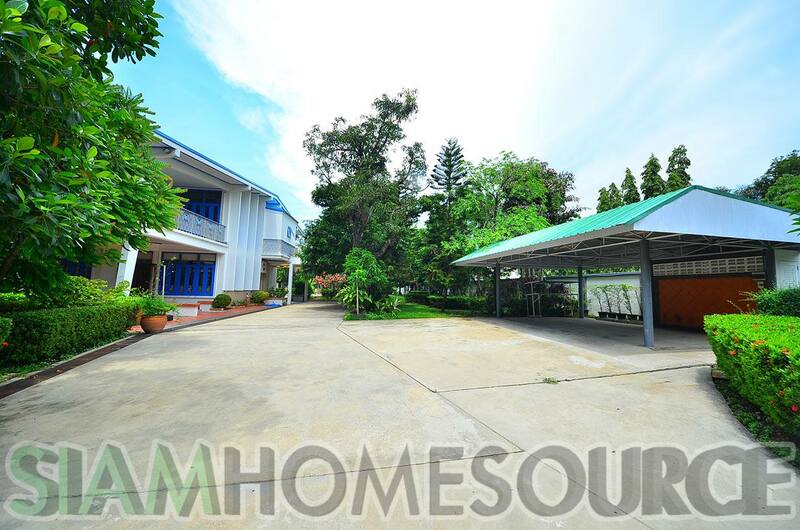 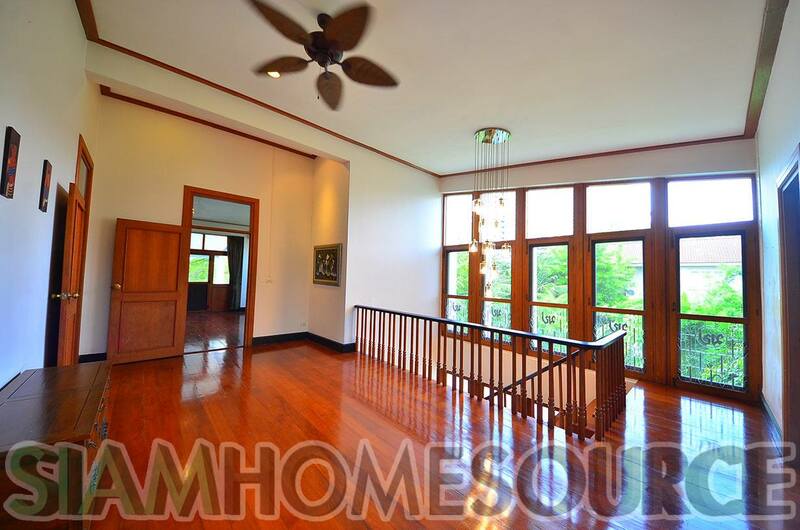 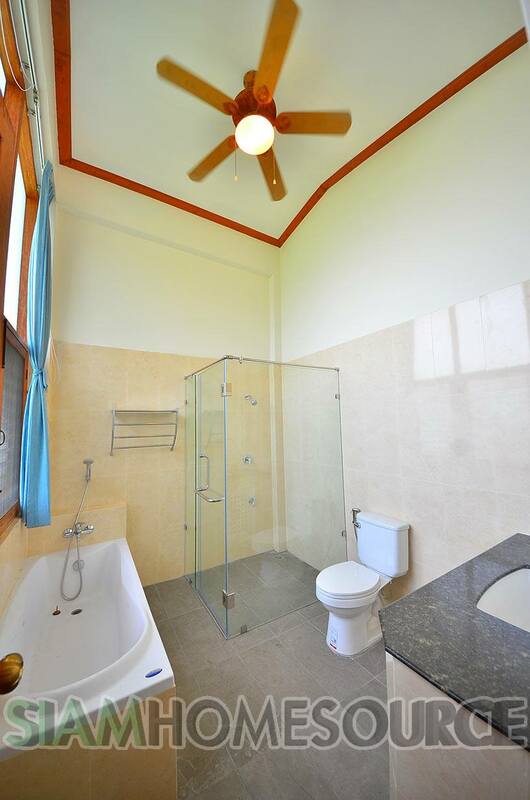 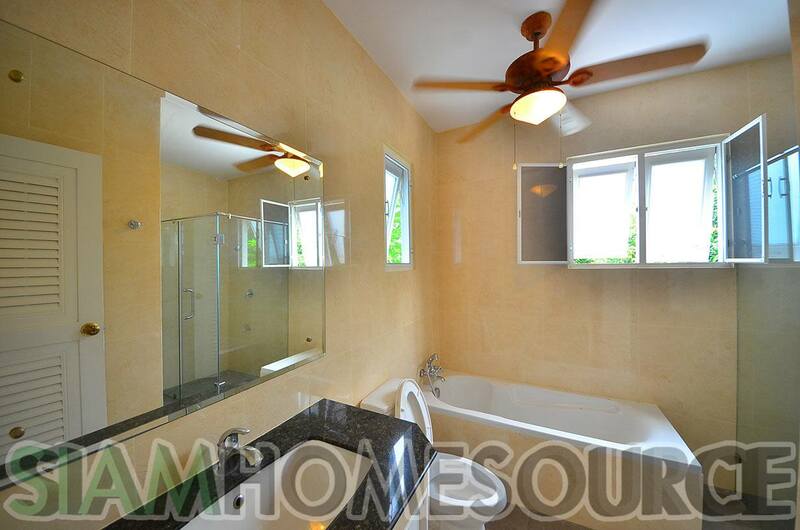 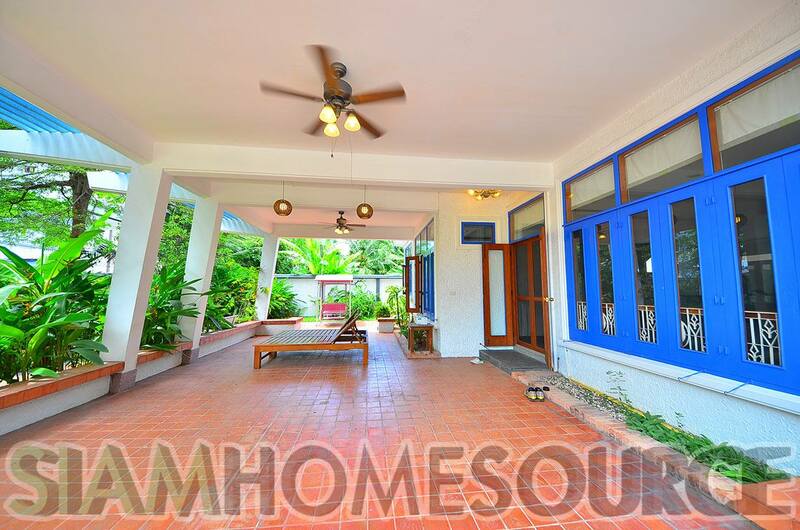 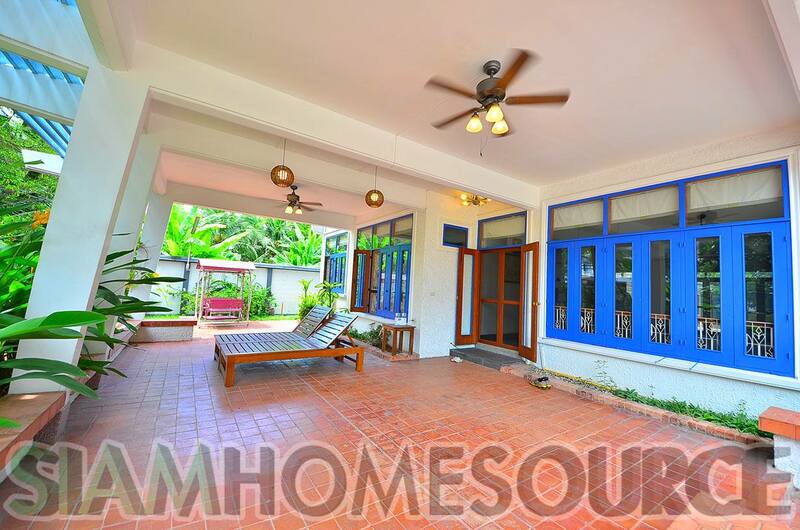 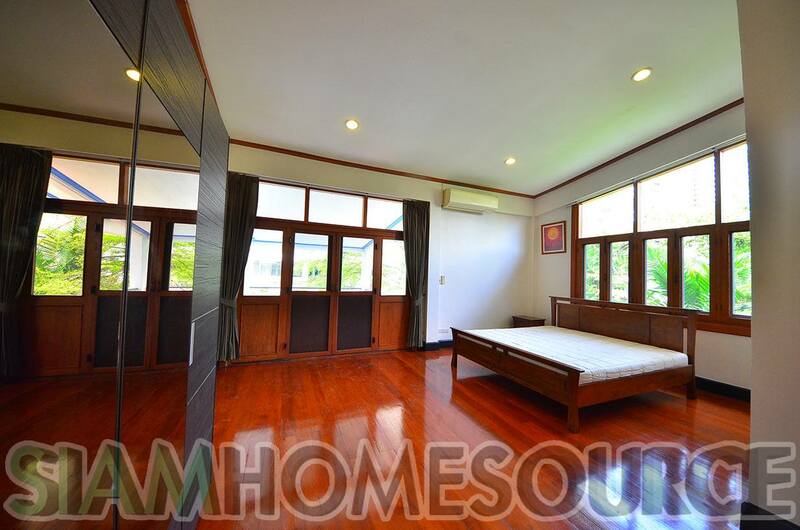 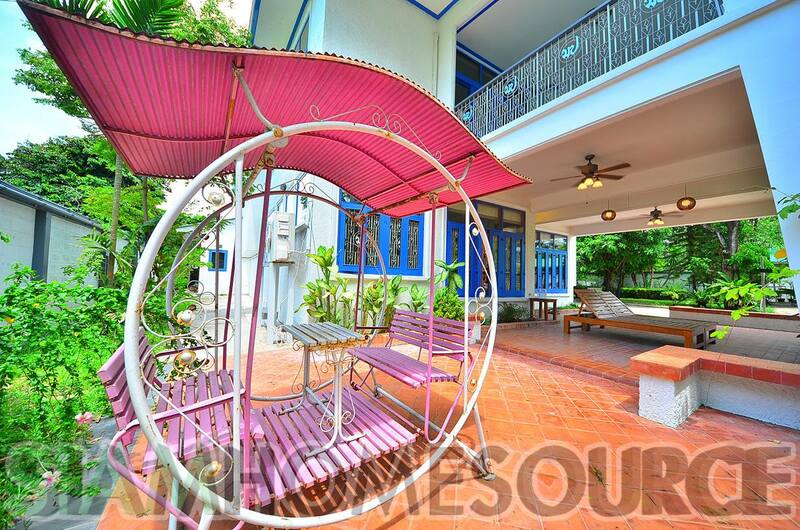 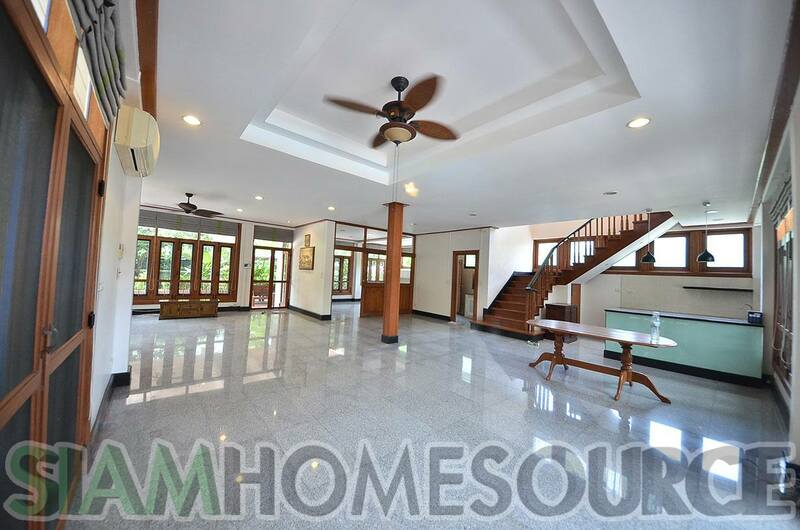 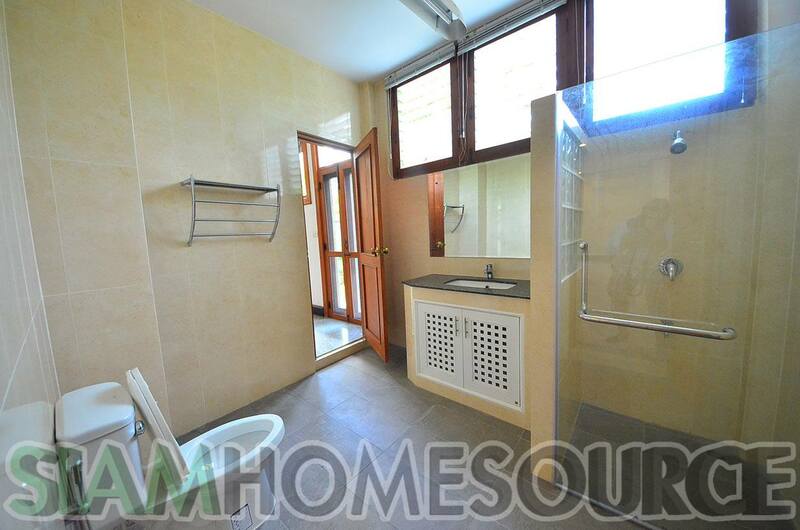 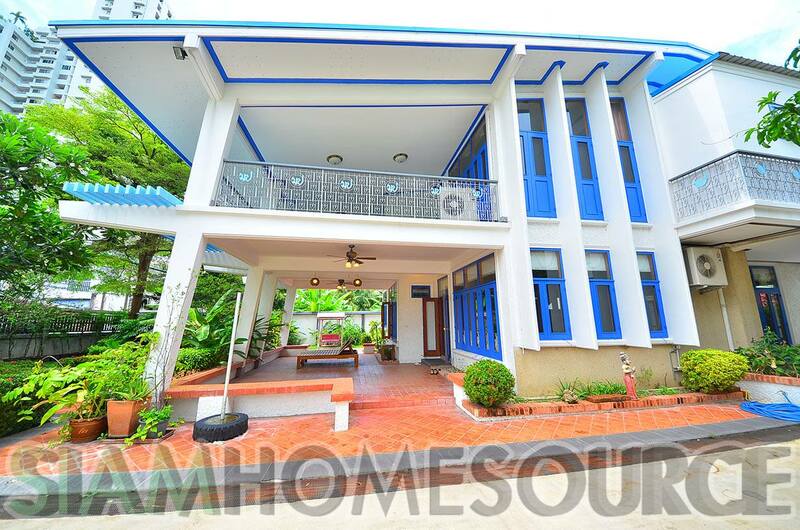 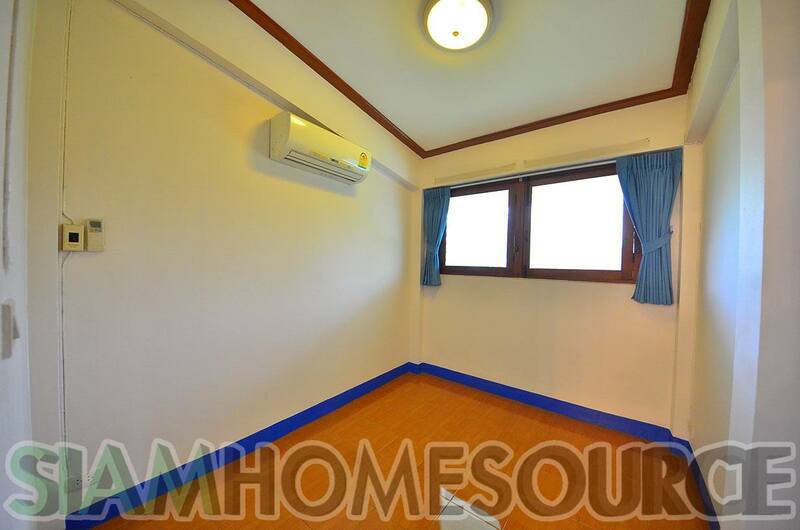 As you walk in it is immediately apparent that is not your typical Bangkok house rental. 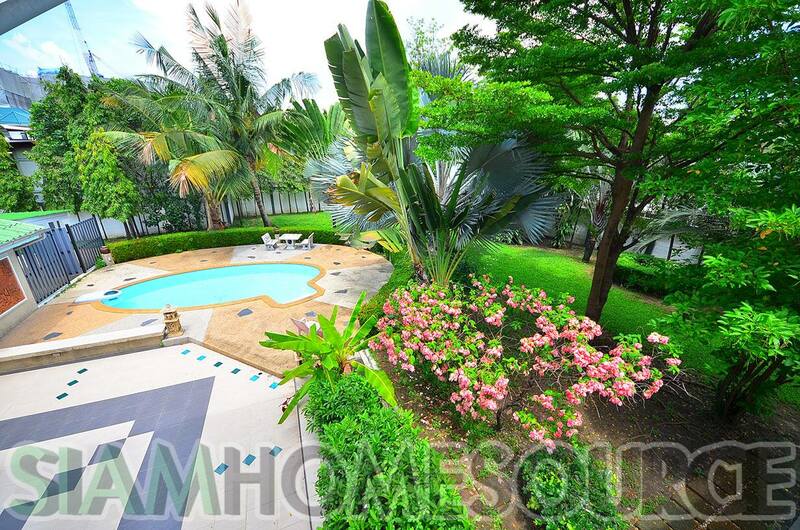 You will immediately notice the house sits among a lush tropical garden setting in a private land plot of remarkable size! 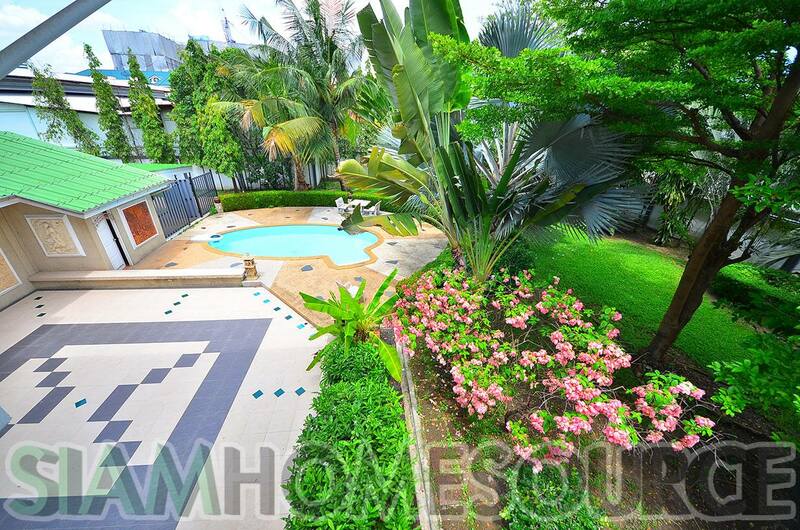 The 300 talang wah (1,200 square meter) land offers plenty of space for pets, nature lovers and anyone who enjoys the peace and tranquility of a tropical setting right in the heart of Bangkok’s Phrom Phong district. 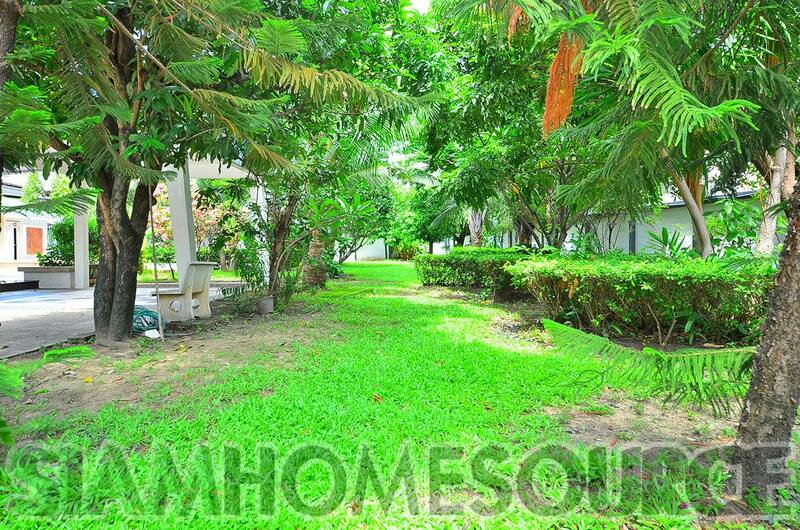 On the green land plot you will find seasonal fruit trees, beautiful flowers and many varieties of tropical plants. 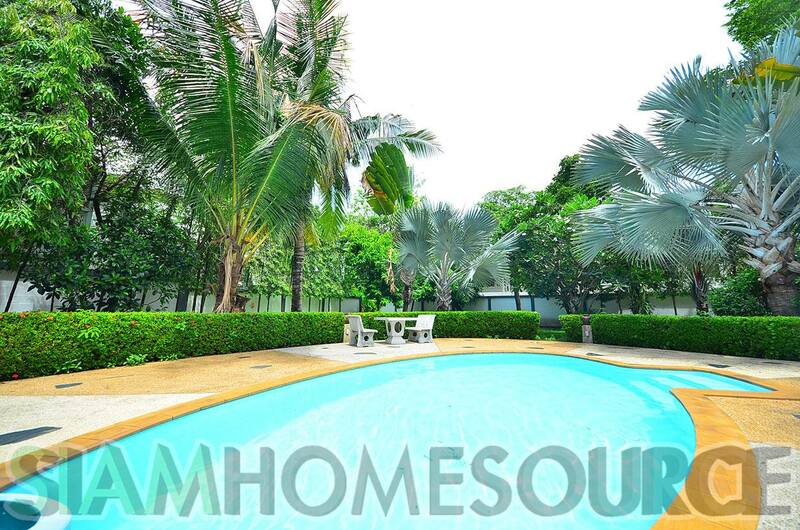 The Bangkok family house that shares the land with Mother Nature is just as charming as the land plot itself. 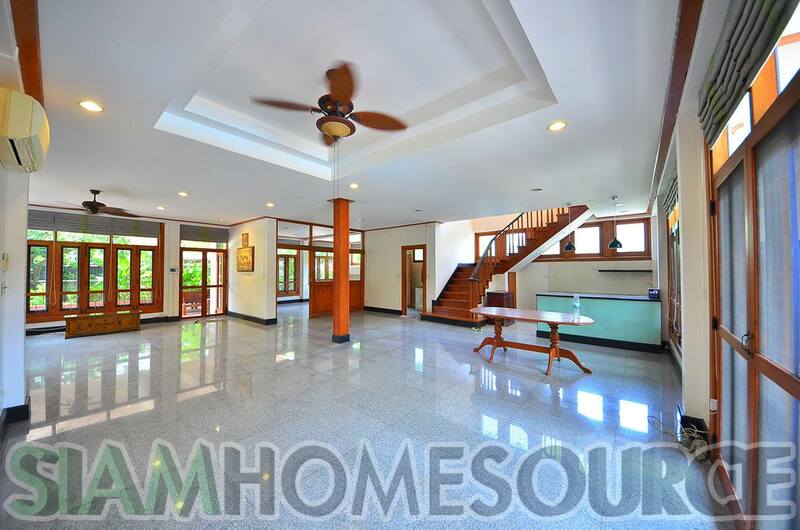 The house is well maintained and feels like home immediately after setting foot inside. 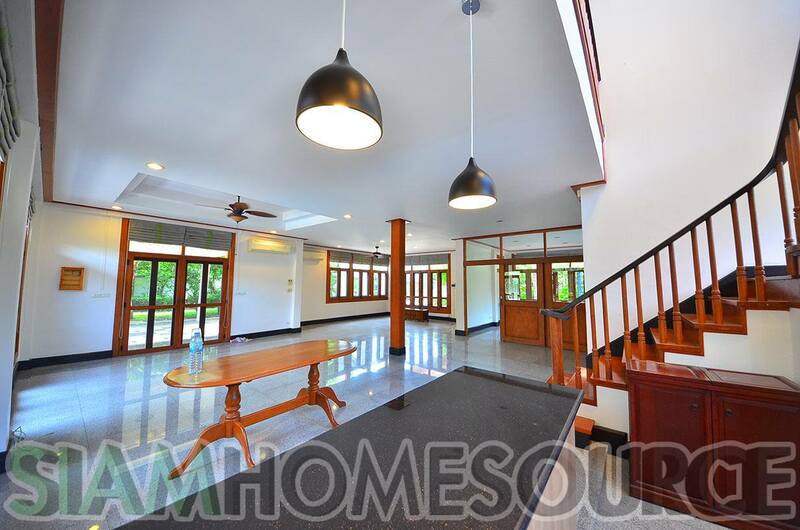 The ground floor features a spacious, open living and dining area, a separated office room, guest toilet and bar. 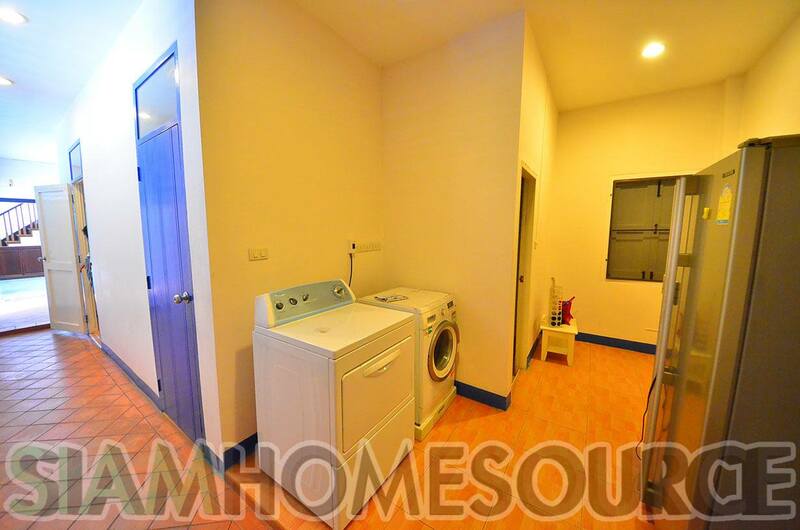 The bar leads into the kitchen area which leads into the area of the dual maid’s quarters, secondary kitchen and laundry area. 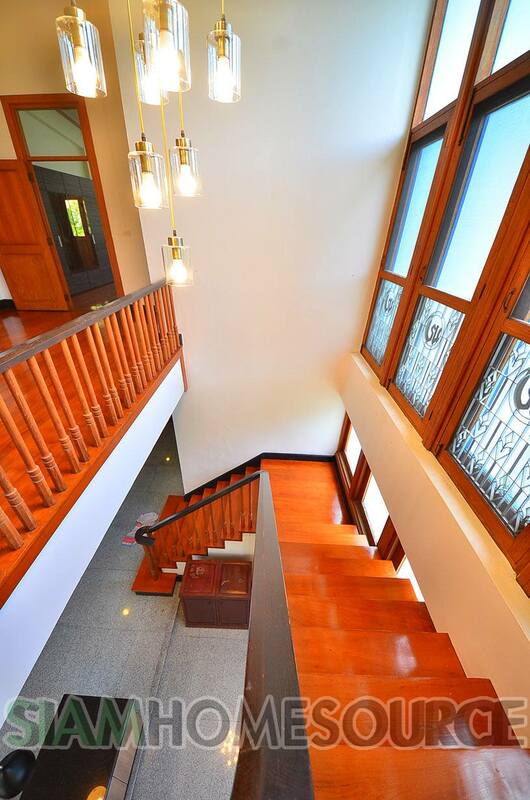 Up the wooden staircase on the second floor you will find 3 full sized bedrooms and a 4th room suitable for a baby’s room or storage. 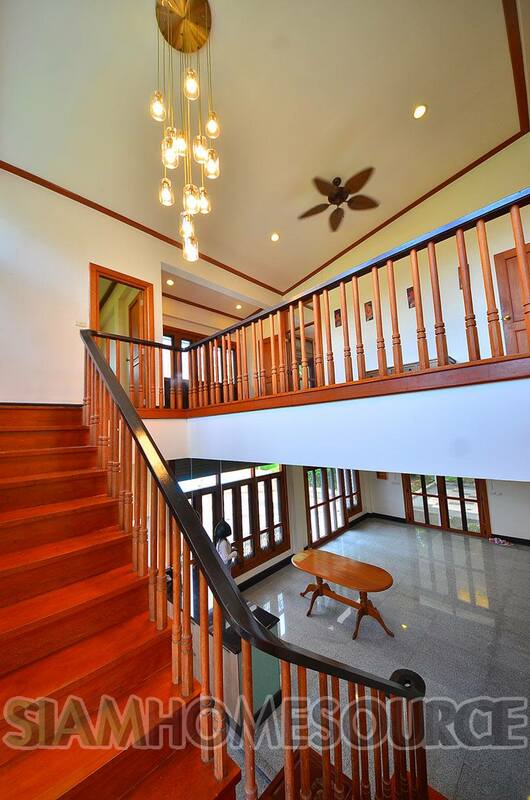 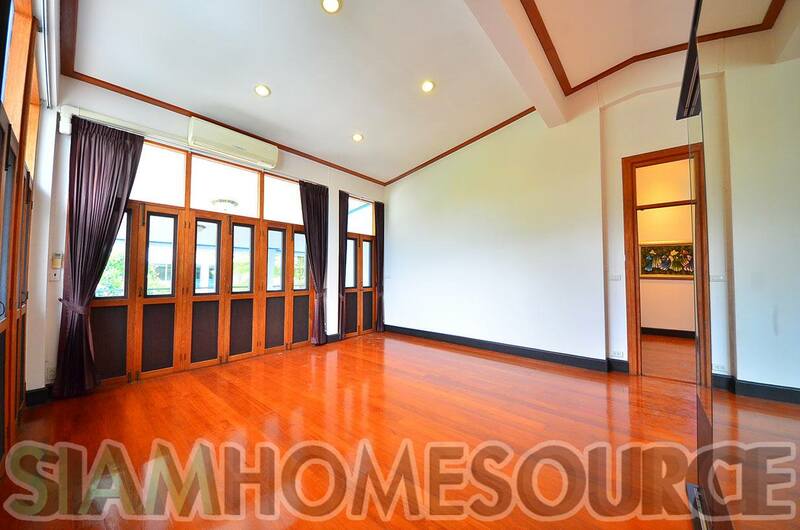 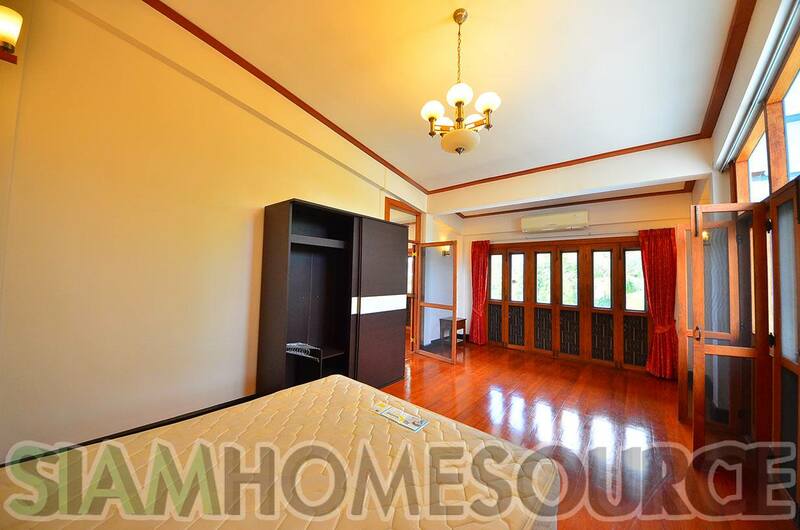 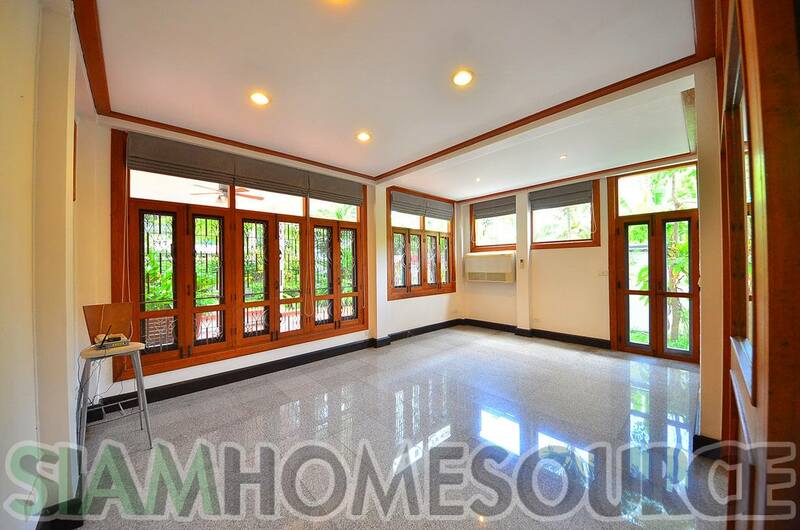 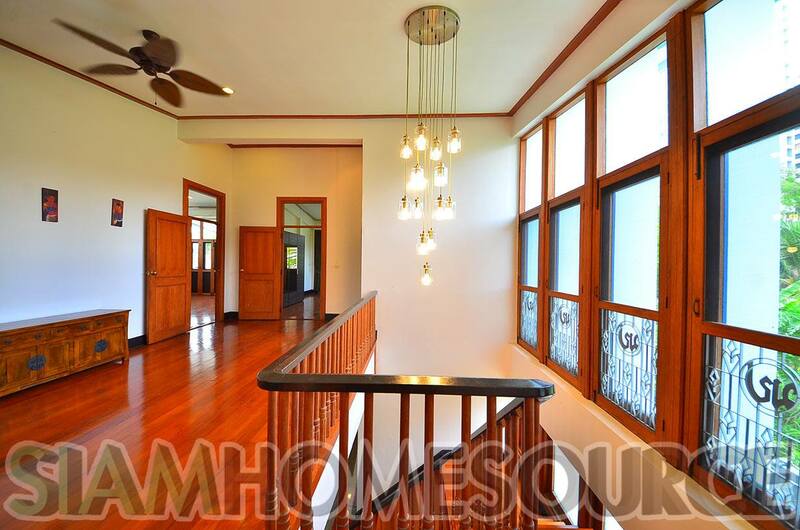 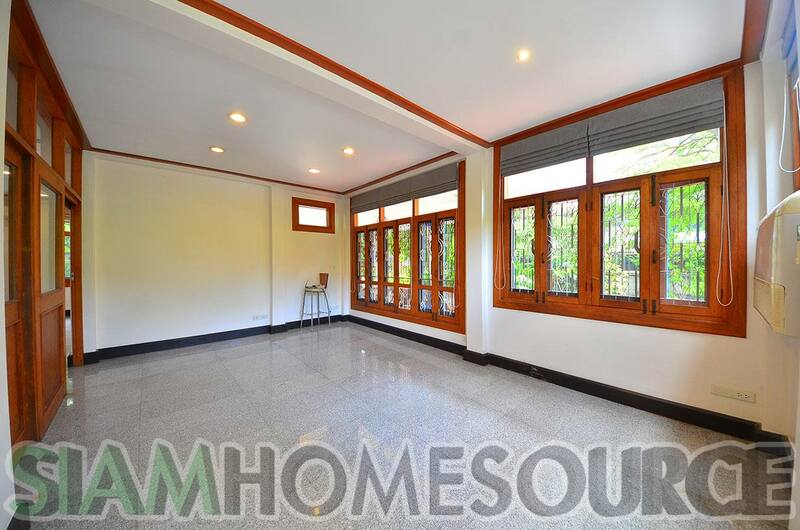 This Bangkok family house has beautifully maintained woodwork throughout including wooden floors which produce the satisfying creaking and cracking sounds that those who grew up in similar houses will be appreciate greatly. 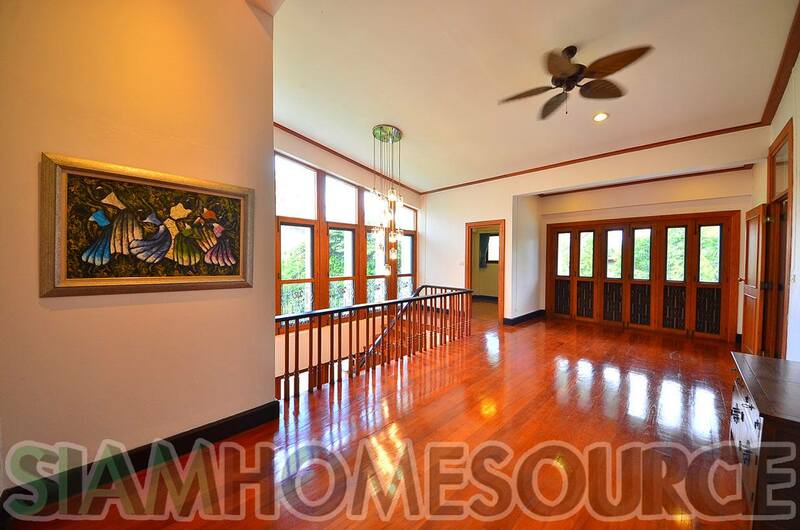 The house gets plenty if air flow when all the doors are closed but most of the doors can be opened to create optimal airflow. 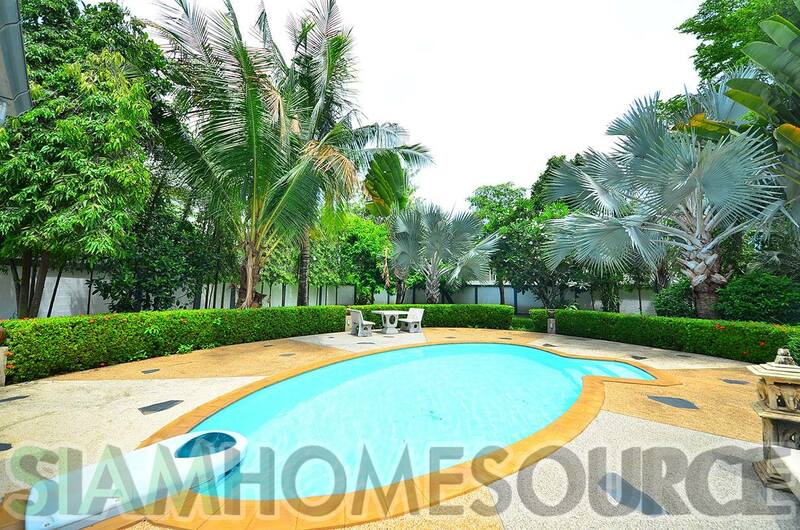 This Bangkok family house’s outdoor space is equally as fantastic, featuring 2 very large balconies on the second floor, one overlooking the pool and back garden while the other overlooking the front garden. 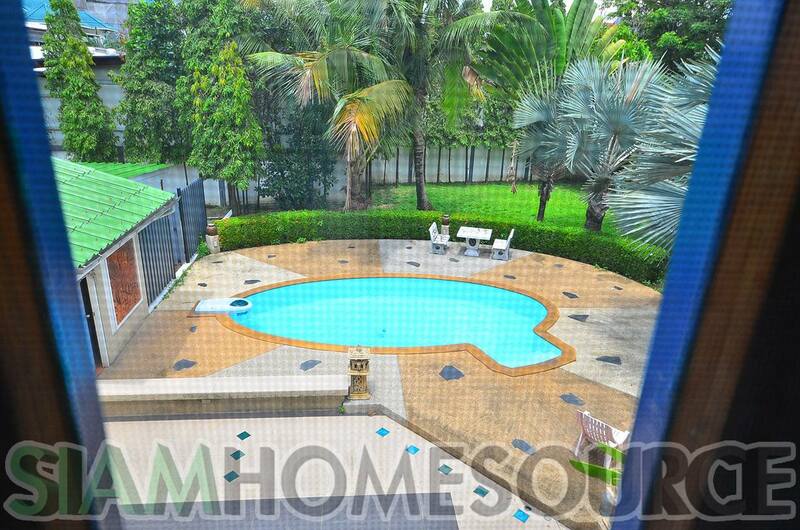 On the ground floor there is a covered front patio with ceiling fans and in the back there is a large poolside patio! 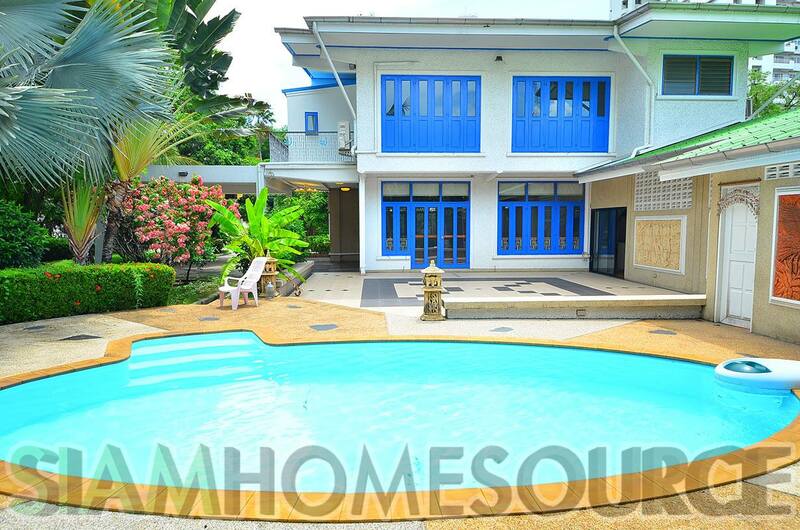 The well maintained swimming pool is just a meter or 2 from the house across the patio. 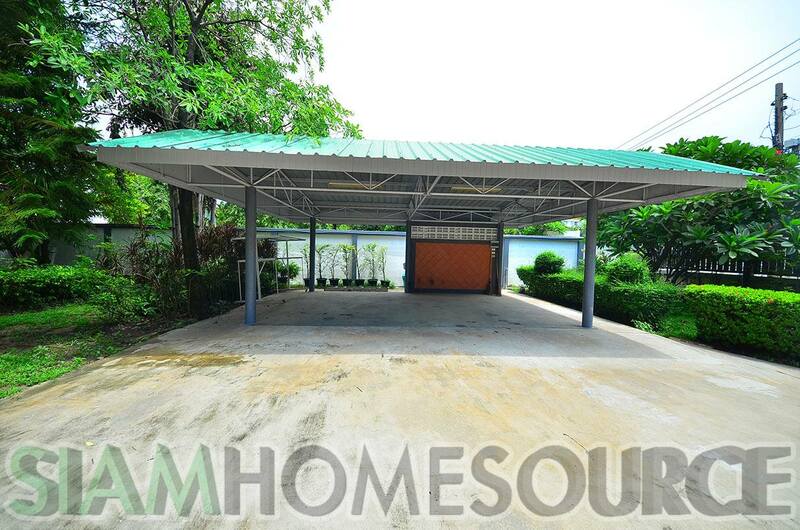 There is a spacious driveway with 3-covered car parking, and plenty of space for 10 or or more cars in case of family get-togethers. 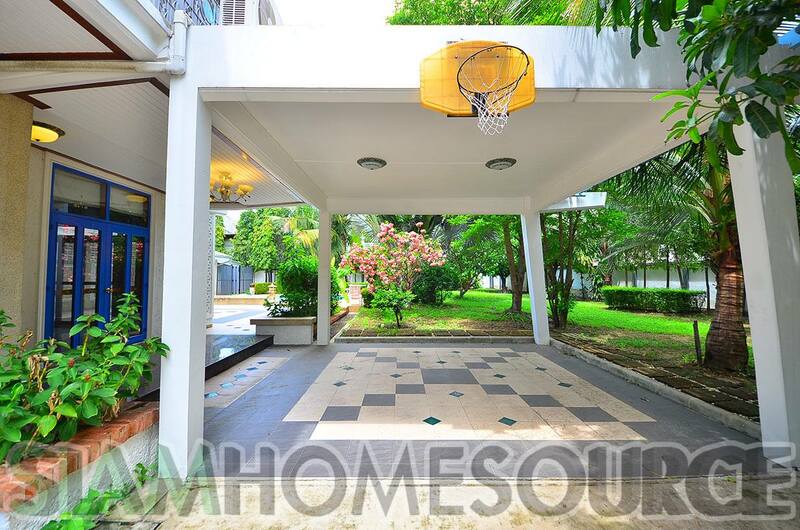 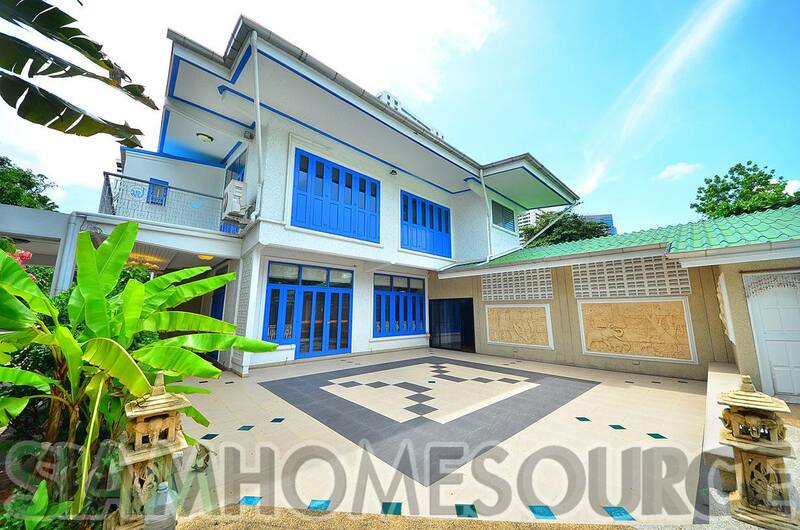 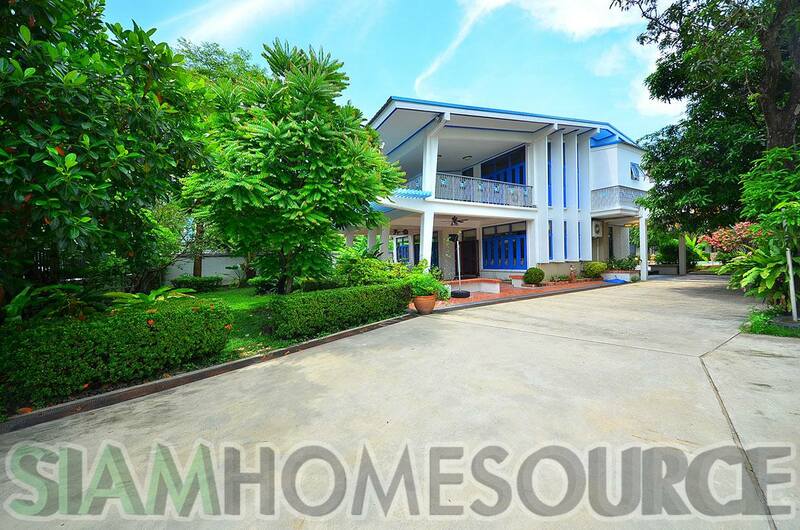 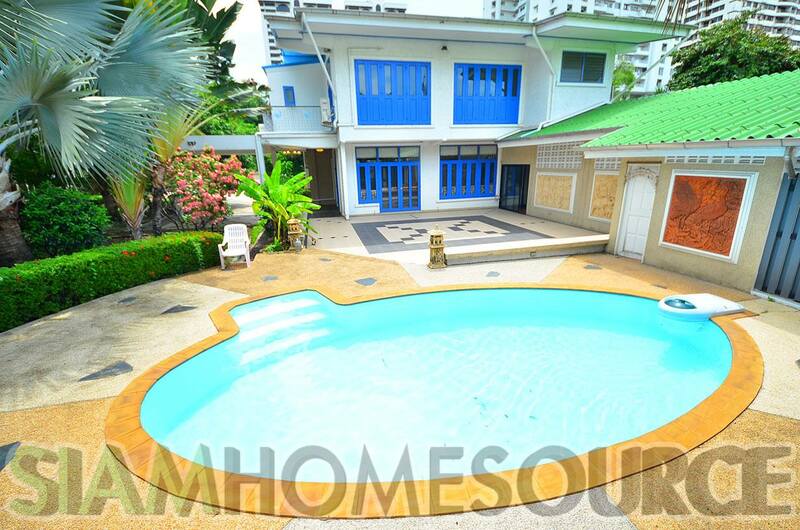 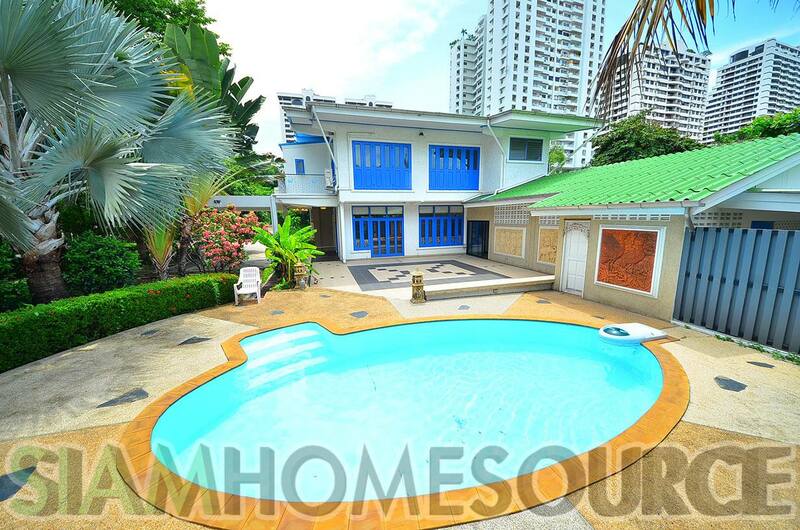 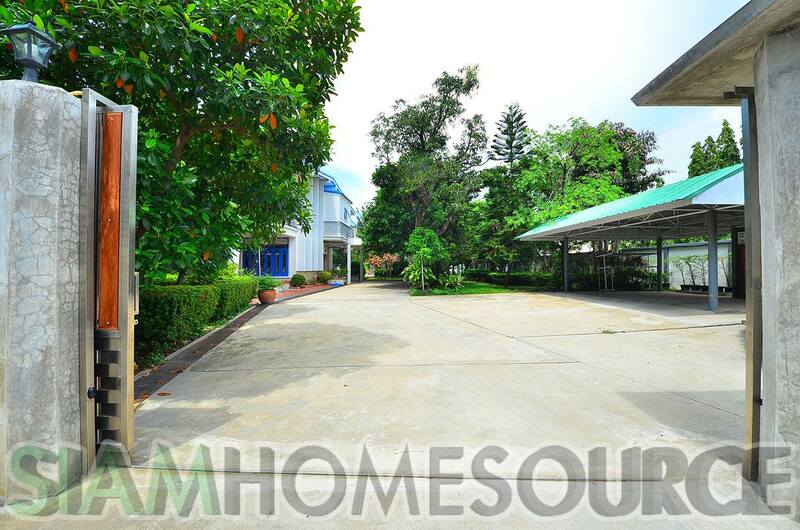 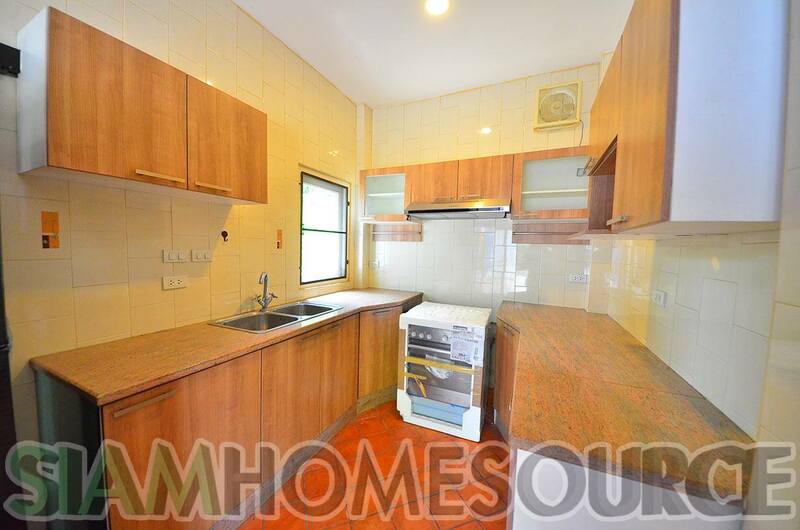 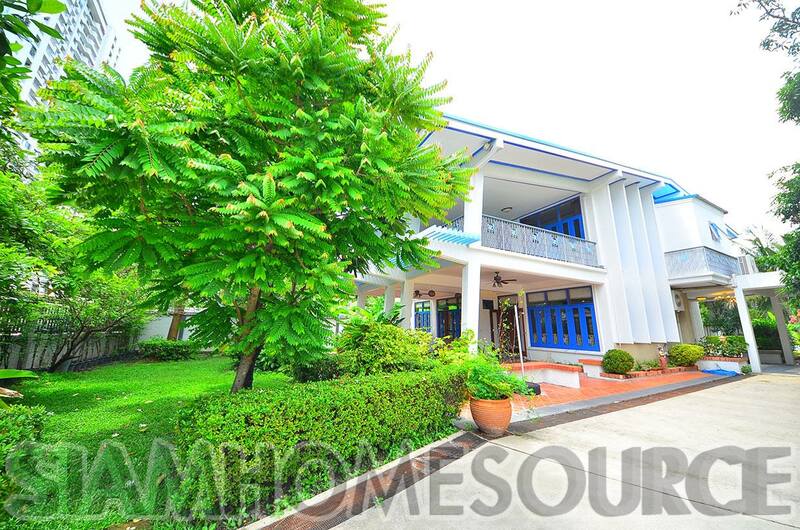 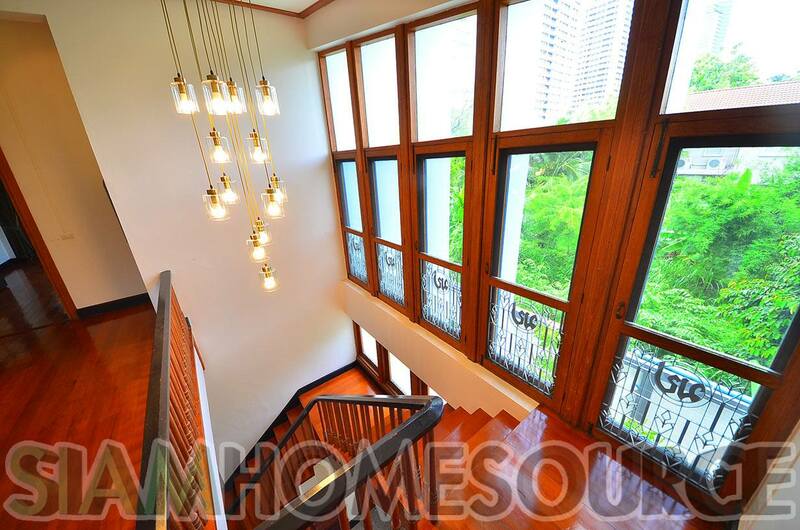 This Bangkok family house is situated in a super quiet and low traffic area of Phrom Phong. 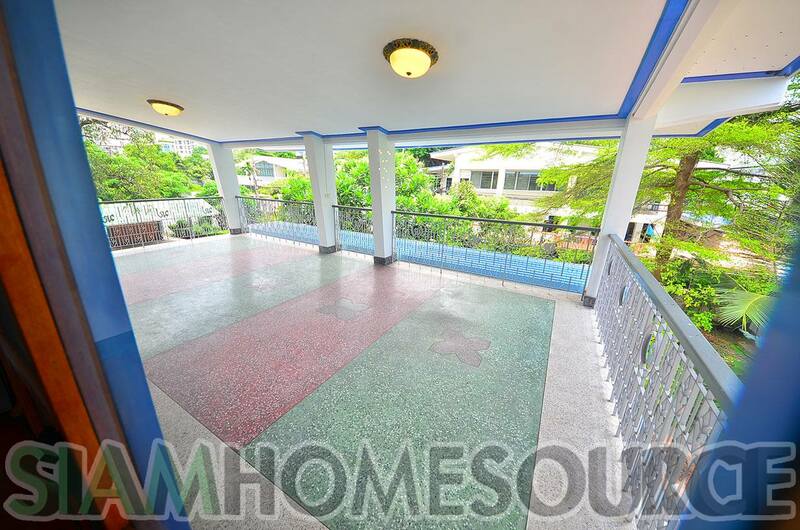 The location is about 1.5-1.7km to both the Phrom Phong BTS skytrain and the Petchaburi MRT station. 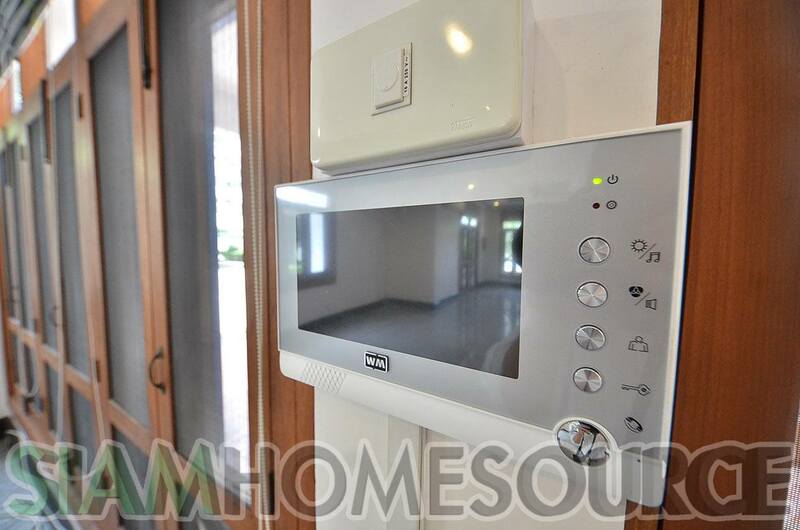 The location allows driving access to Asoke and Thonglor as well. 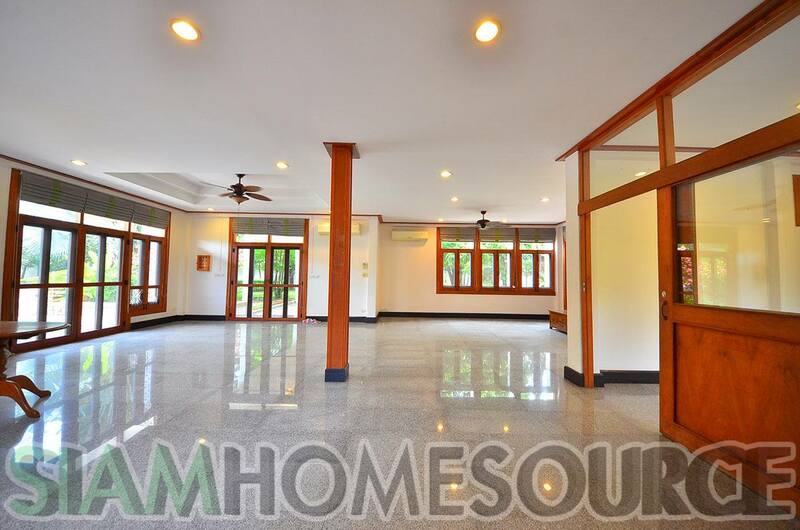 We value your business and guarantee you will find your dream home in Bangkok or anywhere in Thailand. 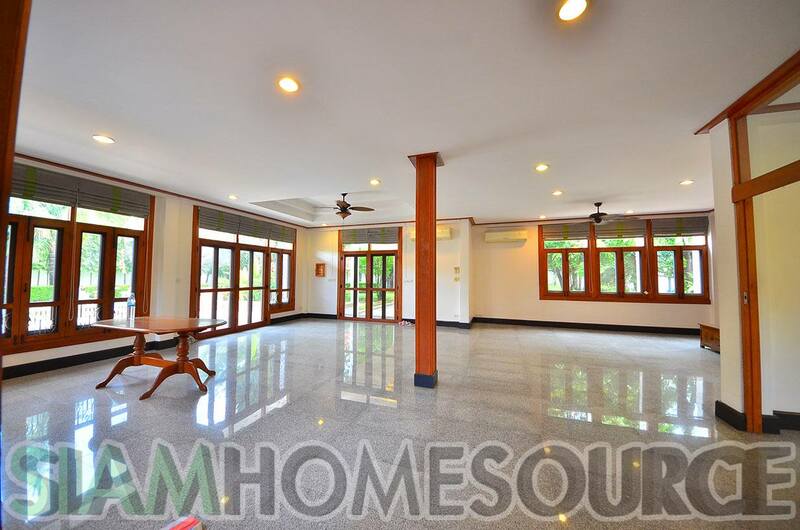 Use the detailed email contact forms for Rentals or Sales or call/SMS us at +66 (0) 92-956-1500 to schedule a viewing or inquire about a home that meets your specific needs.